Tickets: Adults €15, child up to 12 and reduced €7 Duration of the performance: 1 hour Age restriction: 3+Young guests and their parents will experience a bright show with colorful decorations and costumes that will give children unforgettable memories. 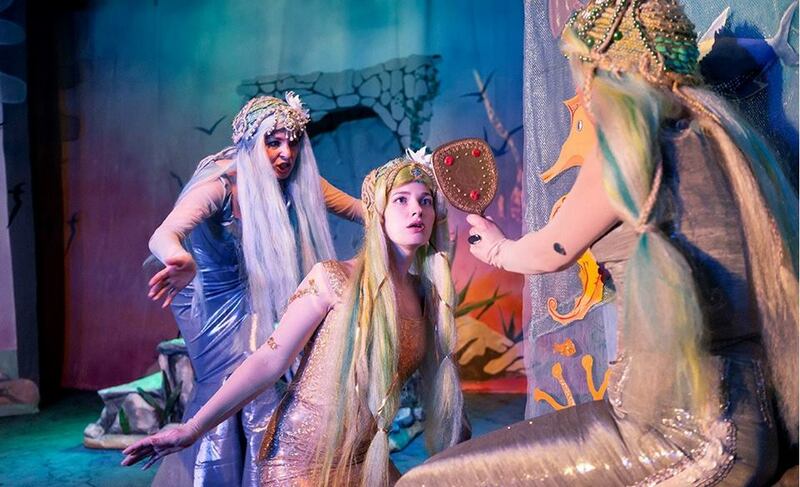 The performance will be shown in Russian with Greek and English subtitles.The heroes of the fairy tale, performed by actors of the theater “Glas” will tell about self-sacrifice and the savior power of love, and the set design will help the children’s imagination to be transported into the world of the sea depths, and then to the prince’s castle.The Little Mermaid is a fairy tale by the world famous Danish writer Hans-Christian Andersen, first published in 1837. Since then, it has inspired many directors, artists, publishers, and musicians. If today we ask: “Do you know Andersen’s The Little Mermaid?” Most will answer: “Yes, a beautiful and sad tale.” However, few know this story as it was created by Andersen, and do not think about the deep ideas hidden behind the “mermaid” story. Numerous interpretations have deprived this tale of the most important – the Christian worldview of the author. What remained in the memory is that the little Mermaid dreamed of getting legs in return for the tail and died. But she was dreaming of getting an immortal soul. That was the story in the very first edition of H-C. Andersen 1837! Moreover, the end of this story is happy. Information about tickets (15/7 euros) is available at https://shop.tickethour.com/, as well as by calling 22 761 607 and e-mail roscentcyprus@gmail.com. The performance will be shown with the support of the Ministry of Culture of the Russian Federation in the framework of the project “Russian Theatre Seasons in Cyprus” organized by the Russian Embassy in Cyprus and the Russian Cultural Centre in Cyprus, which is being implemented under the auspices of the President of the Republic of Cyprus, Mr Nicos Anastasiades.